Polaroids started out as a democratic toy to make photography more accessible to everyone, and like a lot of democratic design (think everything modernist ever), they eventually ascended to high art. And now the film is discontinued. Sad! 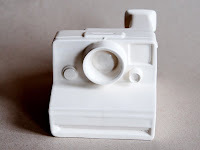 You can still declare your Polaroid love, though, with this lovely hand-cast sculpture from Yellow Owl Workshop.